Renovated, 2 bedroom available in elevatored building, very large units (975-1090 sq ft.) with balconies. ON SITE RESIDENT/MAINTENANCE MGR. Close to West Edmonton Mall, Bus outside door, YMCA rec centre, medical facilities, shopping, Anthony Henday and Whitemud freeways. 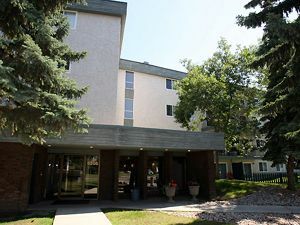 Includes fridge, stove, dishwasher, and smart card laundry on every floor, AND parking. Sorry NO pets. 55+ building. *See also: ViT#60255, ViT#60253 for other units in this building.